Professor Pappu joined Washington University in 2001. He received his PhD in biological physics from Tufts University and completed two biophysics postdoctoral fellowships at Washington University and Johns Hopkins University Schools of Medicine. 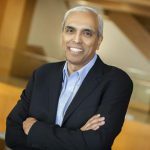 Professor Pappu is the director of the Center for Biological Systems Engineering, co-director of the Center for High Performance Computing, and a member of the Hope Center for Neurological Disorders. Professor Pappu’s research interests are focused on intrinsically disordered proteins (IDPs), specifically their roles in transcriptional regulation, receptor mediated cell signaling, and cellular stress response. The Pappu lab has pioneered the combined use of polymer physics theories, novel homegrown computational methods, and experiments to probe the functional and phenotypic impacts of IDPs. Professor Pappu’s lab also has a significant effort that is focused on neurodegeneration in Huntington’s and Alzheimer’s diseases. The central goal is to understand how protein aggregation and protein homeostasis pathways collude to give rise to neuronal death as a function of aging.